The foundation of the L-2500 is a pair of G&L Magnetic Field Design humbuckers backed by the flexible Tri-Tone control system, providing the sort of versatility that’ll let you find your tone no matter what kind of bass line you’re laying down. The Tri-Tone system features a trio of mini toggles for pickup selection, series/parallel signal routing and active/passive operation, as well as a trio of knobs for volume, treble and bass. With all that under the hood, the L-2500 brings the kind of chops that’ll fit in any situation, from classic R&B to power-packed rock to poppin’ funk. What’s more, the L-2500 features an innovative Leo Fender-designed Saddle-Lock bridge to transfer string energy right into the body end-grain for an incredibly resonant instrument. The Tribute Series L-2500 delivers the magic of Leo’s revolutionary design at a price attainable for every working musician. This JB-5 projects a time-honored yet subtly progressive vibe, embracing the past yet unafraid of moving forward. The slim, hard-rock maple neck features an easy-playing satin finish, while its comfortable 9 1/2" radius and Jescar 57110 medium-jumbo nickel-silver frets deliver silky playability. Its Leo Fender-designed Saddle-Lock™ bridge to transfer string energy right into the body end-grain for an incredibly resonant instrument. The moment you open the deluxe Tolex hardshell case, you’ll be greeted with an instrument of timeless elegance and a delicious aroma that’ll have your pulse racing. The foundation of the L-2500 is a pair of G&L Magnetic Field Design humbuckers backed by the flexible Tri-Tone control system, providing the sort of versatility that'll let you find your tone no matter what kind of bass line you're laying down. The Tri-Tone system features a trio of mini toggles for pickup selection, series/parallel signal routing and active/passive operation, as well as a trio of knobs for volume, treble and bass. With all that under the hood, Leo gave the L-2000 the kind of chops that’ll fit in any situation, from classic R&B to power-packed rock to poppin’ funk. With the addition of a meaty low 'B', the L-2500 brings a crushing bottom end that's tight and well defined. What’s more, the L-2500 features an innovative Leo Fender-designed Saddle-Lock bridge to transfer string energy right into the body end-grain for an incredibly resonant instrument. On the other end is a comfortable, C-shaped neck checking in with a modern 12" radius and 21 Plek-processed medium-jumbo nickel frets ready to deliver silky playability. 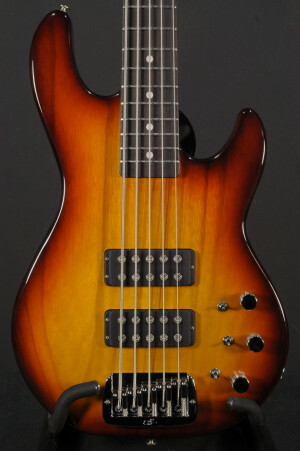 This JB features a Premium Quilted Maple Top, and an Old School Tobacco Sunburst. Used and in excellent condition. Players fond of the old adage "if it ain't broke…" haven't played a JB. You see, the G&L JB is all about refinement, blending "holy grail" Alnico single-coil tone with modern improvements and superb craftsmanship. The JB's classic Alnico V pickups have tone reminiscent of the best examples from the early '60s, thanks to the work of Paul Gagon, G&L VP Engineering. The JB projects a time-honored yet subtly progressive vibe, embracing the past yet unafraid of moving forward. The slim, hard-rock maple neck features an easy-playing satin finish, while its contemporary 12" radius and Plek-dressed medium-jumbo nickel frets deliver silky playability. What's more, the JB features an innovative Leo Fender-designed Saddle-Lock bridge to transfer string energy right into the body end-grain for an incredibly resonant instrument. The moment you open the deluxe Tolex hardshell case made by G&G Quality Case, you'll be greeted with an instrument of timeless elegance and a delicious aroma that'll have your pulse racing. Three decades ago, the G&L L-2000 bass served notice that company founder Leo Fender was ready to disrupt the status quo. The bold, brash L-2000 and the L-2500 five-string that followed have always been an exhilarating experience for players with the skill to pull it off. Now the new M-2000 and M-2500 harness that power with a sonic palate that will surprise and delight new and die-hard G&L fans alike.